I'm pretty sure this wasn't original to the house. 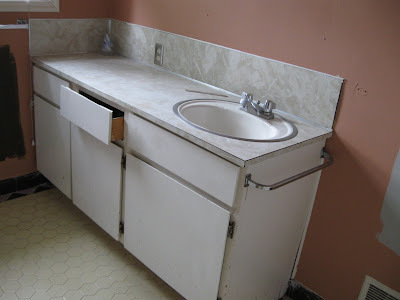 I knew I wanted to rip this vanity out, even as I was walking through the house for the first time with my realtor. Yep, I knew this house was mine even then. The question of the hour concerned the tile and whether it would continue under the vanity. My realtor and I were betting it would, but you never know. I loved the floor tile in this bathroom. 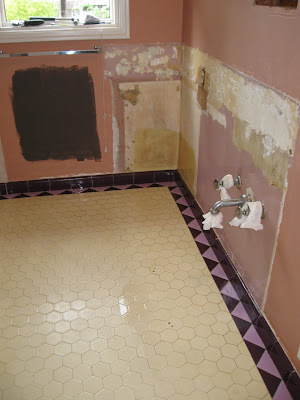 The shower tile (which was not original)? Not so much. And the color scheme they chose in here was puzzling, like Easter threw up. I disconnected all the plumbing and turned off the water at the wall. 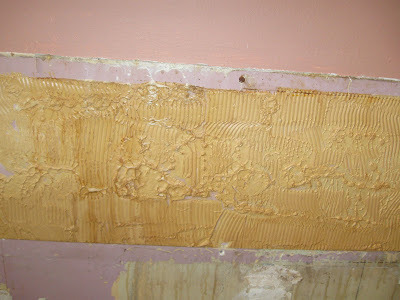 I removed the countertop first, separating it from the wall where I discovered they had used 1/4" of glue. I don't do this for a living, but this seemed like an excessive amount of adhesive. I curse whoever made this decision. I couldn't see where they had screwed the vanity to the wall, so I just pulled for all I was worth. Many things I do, not with brains or brawn, but rather out of stubbornness. It turns out that vanity was indeed screwed to the wall, but I just pulled that mothereffer right out of the wall. My back realllly hurt that night. But I had won! Take that, ugly vanity! The technical term for this is "icky." My spidey sense had told me I needed to pull this vanity out, and I'm glad I listened. There was mold, lots of dirt, hair, and dust. It was a respiratory nightmare, so guess what I did? I PUT ON A MASK. Go me. Some bleach and elbow grease later, and I had all the grime taken care of. The thick layer of adhesive? I spent four hours chipping that stuff off. 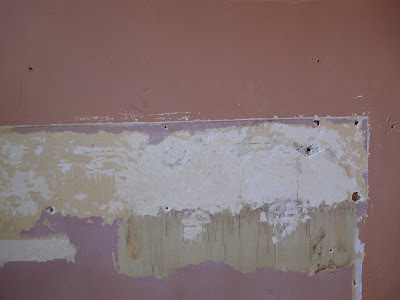 I gouged the hell out of the wall, too. My friend Maura told me, after the fact, that there's some sort of product you can get at the hardware store that will melt this stuff off. But where's the fun in that? It's not like I had anything else to do in the house. Ahem. 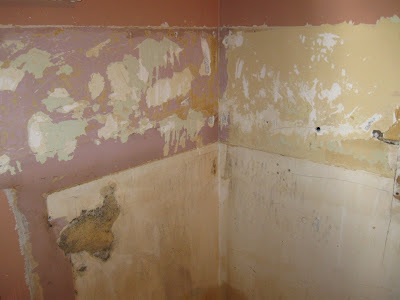 It's sort of fun to see the old layers, the paint choices made by people 50 years ago. People back then were COLORBLIND. I bought a Kohler pedestal sink on craigslist for $40 and was so excited to install it. Once I started digging around on the Internet I found out they call it "the graduate school project of DIY." It turns out you need to open the wall and install a crossbeam into which you can bolt the top part of the sink. It's tricky and there's a chance that you can crack the sink if you have something a few millimeters off. I firmly believe I could do this, given some help and lots of time, but I didn't have a lot of time, and I had many other projects to do. So I decided to let the pedestal sink go and install a new vanity. Of course, the one I wanted wasn't in stock so I had to order it. I was still awaiting delivery when I moved into the house, which meant I got to brush my teeth in the kitchen sink for two weeks. 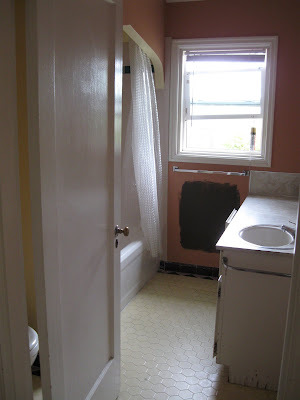 I spackled all the gouges and holes in the walls and primed the bathroom with a gallon of Kilz. Then I scrubbed the hell out of the bathtub and toilet. 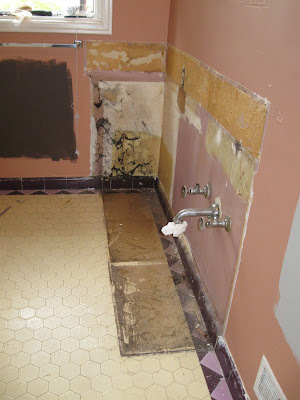 Future plans included painting the bathroom, recaulking the tub, and replacing the wax ring on the toilet. I'm ambitious. Or dumb. One of the two.